The Chmelka group has a long history of forefront contributions in the design of new porous materials. They have recently shown that organosilane additives can be used to tune the hierarchical porosity and large external surface areas of nanocrystalline zeolites. These materials can accommodate very large hydrocarbon molecules, which may allow recycling of plastics into the monomers from which they are derived. Current work seeks to understand the role of fluoride and other structure-directing agents in determining zeolite synthesis, motivated by the prospect of creating new classes of porous oxide catalysts. They also synthesize and engineer functionalized inorganic-organic hybrid materials incorporating nanoparticles, covalently grafted moieties, conjugated polymers, controlled release agents, and enzymes for opto-electronics, energy storage, catalysis, and structural applications. The McFarland group couples fundamental processes at surfaces with novel material systems to facilitate reactions related to the production and utilization of chemical fuels. In particular, fundamental surface chemical-electrical phenomena related to catalysis and photoelectrocatalysis are under investigation. Their group develops and uses automated, high-throughput, synthesis and screening systems combining traditional chemical approaches to combinatorial methods for new material and material system discovery and optimization. McFarland and Gordon are also working on novel routes for light alkane conversion using halogens and molten salt systems, as well as advanced chemical manufacturing using nuclear photochemistry and photocatalysis. The Scott group is developing new catalysts for olefin polymerization, alkane and alkene methasis, and conversion of non-food biomass feedstocks (lignocellulose and soluble carbohydrates) to fuels and platform chemicals. The overarching goal is to understand the interactions and transformations of molecules in solution and at gas-solid interfaces by creating highly uniform, grafted active sites. 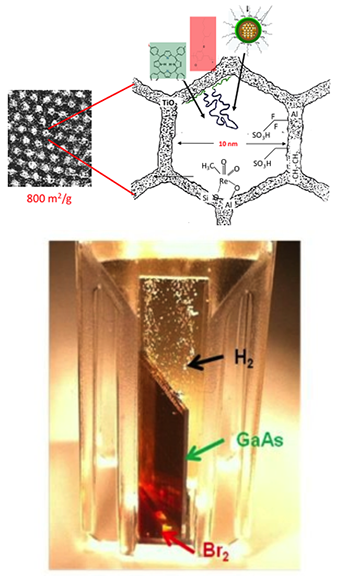 Their work combines techniques from organometallic and coordination chemistry, surface science, spectroscopy, kinetics, mechanistic analysis and modeling to investigate, design and re-engineer heterogeneous catalysts. Many of the catalysts that Professor Scott studies are isolated metal atoms dispersed or grafted to amorphous supports. While heterogeneous catalysts like zeolites and metals have been extensively modeled, these amorphous catalysts are a challenging and relatively unexplored theoretical frontier. In collaboration with Professor Scott, the Peters group uses quantum mechanics, statistical mechanics, rare events tools, and machine learning techniques to identify the structural characteristics that distinguish active sites from dead sites, to compute site averaged kinetic properties, and to quantitatively test hypotheses about mechanisms and active sites. The Doherty and Chmelka groups are investigating a radically new way of capturing CO2 from stack gases which converts gaseous CO2 at atmospheric pressure into cement. The heart of this process is a solution-phase reactive precipitation process to transform gaseous CO2 into calcium carbonate crystals. The Christopher lab focuses on sustainable reaction engineering through various approaches including: (1) the use of photons control the outcome of chemical reactions that are difficult to execute using thermal energy, (2) the development of catalysts with maximized utilization efficiency of Pt-group metals, and (3) the design of materials and processes for selective conversion of hydrocarbons, CO2 and biomass-based feedstocks into higher valued products.